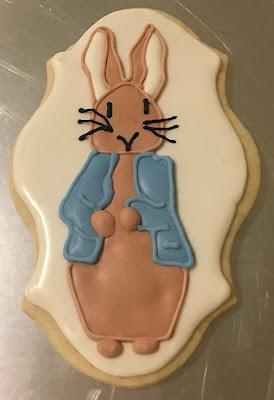 Sweetie Petitti: Hoppy Easter Cookies for the Family! I love Easter. It really does herald in Spring here in the South. Most years, I am already a week or so into running the AC, and this year, I am using up the firewood trying to keep warm and pretend this rain is warm (it's not!). I also love to make place card cookies. It's funny though, we never seem to get around to eating them! I sat down and ate mine the day after Easter, and you know what? It was delicious. He was made for a shower...but bunnies!!! An assortment for a cookie class. These are for all of spring! such a great cookie to use up lots of various colors icing! Instead of platters, we sent the cookies out in baskets! Sweet and simple. The most popular design this year! And there are more, many more. Here's a link to some oldies. Always fun to look back on previous designs. Happy Easter!